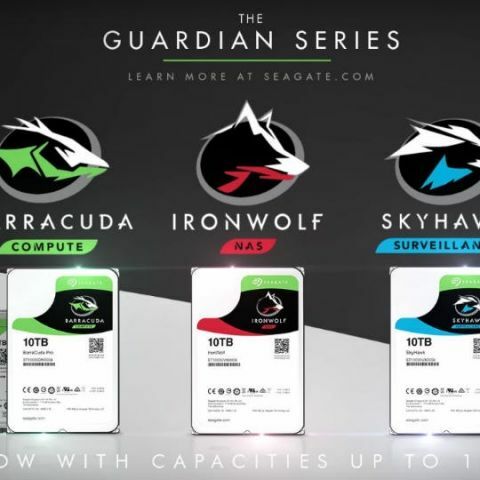 The Seagate Guardian series increase the highest storage variant by 2TB! Seagate has unveiled a new lineup of hard drives that offer up to 10TB of storage. Called the Guardian series, Seagate's new drives can be used in multiple platforms including desktops, laptops, NAS boxes and surveillance systems. The drives include BarraCuda Pro, IronWolf and SkyHawk, and offer industry standard speeds and cache sizes. Seagate has now come up with a new range of hard drives with up to 10TB of capacity. They represent a 2TB increase over the capacity of its previous hard drives in the small business and consumer category. The high-capacity drives, called the Guardian Series, are meant for laptops, desktops, network-attached storage (NAS) and surveillance systems. The new line of hard drives, the Guardian Series, consists of BarraCuda Pro desktop drive, the Seagate IronWolf for NAS applications and the Seagate SkyHawk for video surveillance systems. The speed, of the resurrected BarraCuda line of hard disk drives, ranges from 5,900rpm to 7,200rpm and capacities range from 500GB to 10TB. The drives also come with 16GB to 64GB of DRAM cache, depending on the overall capacity. They are being offered in 2.5-in. laptop form factors which is 7mm thick, small enough for ultrathin notebooks; it offers up to 2TB of capacity. Also, BarraCuda drive comes in 3.5-in. desktop sizes. Besides, Seagate has also announced a new drive, called BarraCuda Pro, which also has up to 10TB of capacity. The drive has a 7,200rpm spindle speed and a data transfer rate of up to 220MB/s. It comes with a five-year limited warranty. The updated BarraCuda drive line will offer sustained data transfer rates of up to 210MB/s. Another one in the Guardian Series is IronWolf. Seagate has refreshed its NAS drive lineup, for small businesses, with the IronWolf brand. The IronWolf brand is aimed at NAS devices with one to 16 drive bays and comes with up to 10TB of capacity and Seagate's AgileArray (formely NASworks) software on it. AgileArray software supports error recovery controls, power management and vibration tolerance for reliable usage when used in multi-bay NAS devices. The IronWolf is rated for up to 180TB of writes per year and the drive can also power down into a sleep mode while not being used. Moreover, IronWolf comes with a Rescue Data Recovery Service plan that protects against data loss from viruses, software issues, or electrical and mechanical breakdowns in a NAS or RAID environment. A failed drive can be sent back to Seagate where its in-house "Rescue Service" will attempt to retrieve data. The drive comes with a three-year limited warranty. SkyHawk HDD, Seagate's new lineup, is a rebrand of the previous Sv35 series video surveillance hard drive. The new drive has a spindle speed of 7,200rpm and comes with a storage capacity of up to 10TB for storing up to 10,000 hours of HD video. It also comes with ImagePerfect firmware from MTC Technology. The main purpose of the firmware is to power down the drive when not in use in a bid to reduce heat generation and excessive power consumption. The HDD then powers up quickly to provide uninterrupted recording. The SkyHawk drives use rotational vibration sensors to help minimize read/write errors quite similar to that of IronWolf. Designed for modern, high-resolution systems running 24X7, SkyHawk drives also come with a data recovery services option. The 10TB SkyHawk HDD also supports up to 180TB worth of data writes per year and has a three-year limited warranty.